OESD and FLush draw vs Top pair. Good call or bad call on turn? I was the chip leader at early phase with an hour left for reg to end. Would like to know was this call made by me bad decision or not. I lost quite alot of chips in this hand. MY opponent is someone who had top pair for sure which I was already aware. Hero had K , 10 (one pair, tens). MP had A , Q (one pair, Queens). The answer to your question is - we could have avoided this dilemma on the turn..
2-we are unlikely to get value if the turn is a club unless our opponent has an ace of clubs. we should get the the right price to hit our draws and trap weaker hands.. I disagree with Muskaan here and feel like we do want to put in as much money in on the flop as possible. I would have preferred check raising with our hand, but leed is fine as well. Once we get raised we have enough equity against even a very tight range to just get it in on the flop, so instead of calling the raise I like going all in. 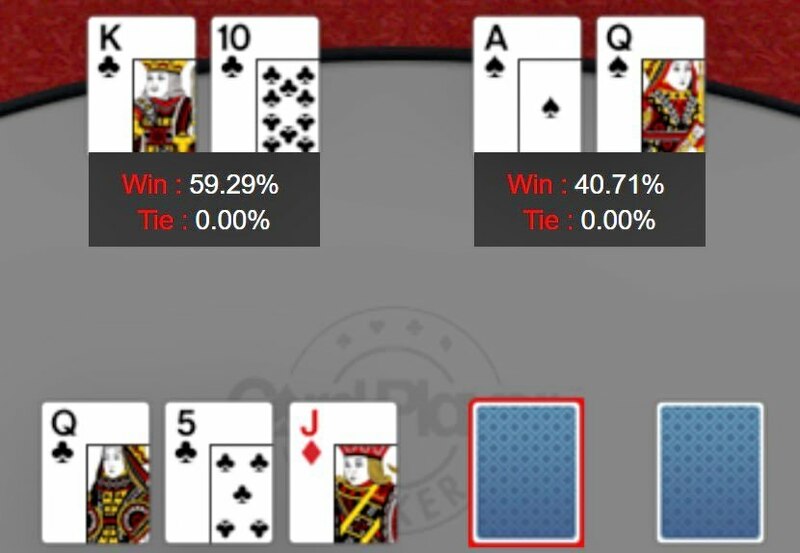 I would go all-ins too on the FLOP. Other conservative approach would be of MUSKAAN, if you are not willing to gamble even on 60-40 favorite odds.